Share the post "Menopause & Fibroids"
For years doctors would tell their patients that the fibroids would shrink after the change of life. But few patients with fibroids made it to menopause because they ended up undergoing a hysterectomy (removal of the uterus) instead. We believe it’s because there’s an unknown substance secreted by fat cells that mimics the effect of estrogen on fibroids. It makes them grow. So does estrogen replacement therapy. What’s the take home message, then? The best time to treat fibroids that are causing symptoms is now. If you’re in your late 40s you are also in what amounts to an “estrogen bath.” Right before menopause when estrogen is removed from the body as the ovaries stop functioning, women will experience several months to years of estrogen dominated menstrual cycles. 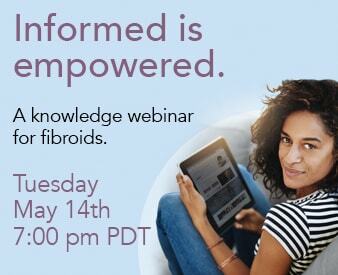 We know that fibroids are estrogen sensitive. This period in a woman’s life is almost always a growth spurt for fibroids. Waiting for “a few years” for fibroids to shrink during menopause is likely to result in a few more years of growth and worsening symptoms of pain and bleeding instead. Food for thought! Contact us for a FREE phone consultation with Dr. Bruce McLucas or call toll free at (800) 645-6095​.